How will we travel tomorrow? From railway vehicles to solar tuk-tuk, Rob La Frenais, who conducts the Future of Transportation project with the Srishti Institute of Bangalore, gives us a few art and DIY ideas. Since November 2015, the independent curator and critic Rob La Frenais conducts Future of Transportation, a research project in art and design with the Srishti Institute of Bengalore in India. In January 2017, the projects of the artists Tania Candiani, Suresh Kumar G., Thomas Lasbouygues and Sudipto Dasgupta have been exhibited on the fringes of the Kochi Biennale in Kerala. For us, he gives the highlights of his keynote at “Mobile Utopia Pasts, Presents, Futures” at Lancaster University on November 4. The Indian artist Sudipto Dasgupta, who makes impossible multi-wheeled velocipedes and ornithopters, always shows his students in Bangalore a found image, of a sari-clad young woman, with flowing hair and scarf, with a mischievous expression, on a skateboard hanging on to a bicycle rickshaw, hitching a free ride. This image, subversive in many ways, both in gender politics and expectations, symbolizes a free-thinking, bottom-up, playful attitude towards the world’s most pressing and urgent problems: how do we traverse the planet sustainably, efficiently and without causing endless congestion? This need is most pressing in Bangalore, India, where often people living in the same city communicate only by Skype, as it can take up to five hours to battle traffic from one suburb of to another and it was in this ruinously congested city that the concept of a project about the Future of Transportation was developed. Dasgupta also introduced me to the “Indian Basic”, an extraordinary workhorse of a heavy bike, used often to balance precariously large cans of milk around villages. I rode one of these around the Bangalore suburb of Yelahanka and it seem to almost teach me itself—by virtue of its weight and stately maneuverability—how to negotiate Indian traffic. The bicycle is, of course, the one item that has been mass-produced on this planet that is the most sustainable and efficient way of moving short to medium distances and is a symbolic totem for the Future of Transportation project, appearing at the head of a highly active Facebook group of that name that covers everything from Hyperloop systems to people who swim to work. Before using “Bicycling on Mars”—a way of describing the ambiguous enigma of small subversive actions applied to massive transport infrastructures—I thought I had better check Google first. In fact there are a number of discussions about how mountain bikes would be a very effective way of exploring the red planet—if we have developed effective and flexible spacesuits for riding them by the time we got there. I will argue here that small, subversive and playful actions by artists, DIY activists and others in the field of transportation can gently nudge and challenge big transport infrastructures towards alternatives and sustainability. The other totemic artefact in this discussion that has interested artists I write about here is the train—written about by sociologist and philosopher Bruno Latour, author of Laboratory Life in his ground-breaking book Aramis or the Love of Technology. This is presented as a discursive drama about the rise and fall of the Personal Rapid Transit system in 70’s France, which would have been an automated system where trains replaced cars in the Paris suburbs and computers would couple up individual rail vehicles to make a longer train. For Latour this story was a way to study sociologically the various “actors” in the drama, the engineers, the RATP (Parisian subway), the French government and to observe their interplay, but for some artists, the fact that this enlightened and futuristic project was abandoned and so completely buried in the annals of technological history was enough to try to build some of these vehicles. 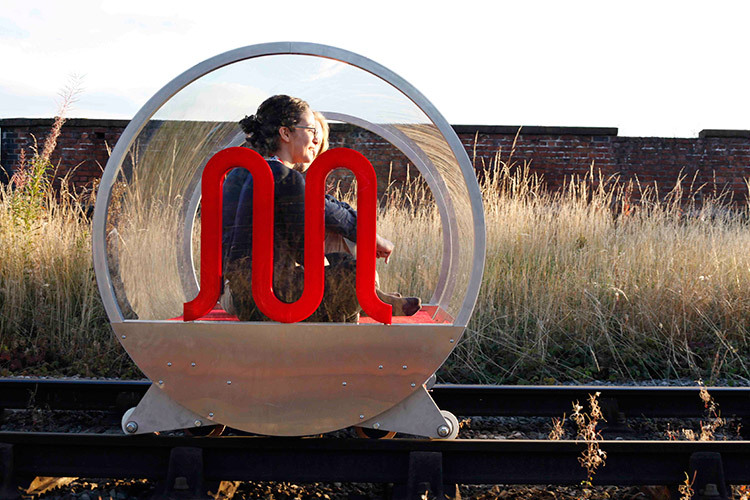 Inspired by the Aramis project, HeHe have devised site-specific personal rail systems around the world—including Tapis Volant in Istanbul (2005), H-Line in New York (2007), Metronome in Paris (2012), M-Blem on the world’s first passenger railway line from Liverpool to Manchester (2012) and Centipede, a new bicycle-powered rail system for the Lot Valley, as part of the Exoplanète Lot site, specific exhibition and residencies, curated by myself and Martine Michard, director of the Maison Georges Pompidou, Cajarc. “M-Blem” from Liverpool to Manchester in 2012. The Centipede project, in artist Helen Evans and Heiko Hansen’s words “merges a futuristic artistic vision with rural regeneration: this autonomous multiple-driver vehicle might one day travel on both road and rail, sustainably.” Both Aramis and HeHe’s vision undercut today’s obsession with self-driving cars in which “roads will become narrower and traffic signals will vanish as autonomous cars, shuttles, and buses blend and interweave in a delicate, syncopated ballet of technological harmony,” from a ironic post in the Future of Transportation Facebook page. HeHe almost seemed to predict the future in their earlier, dystopic Toy Emissions (2007) which featured a miniature SUV emitting dramatically poisonous smoke dodging the wheels of trucks and cars in New York City. 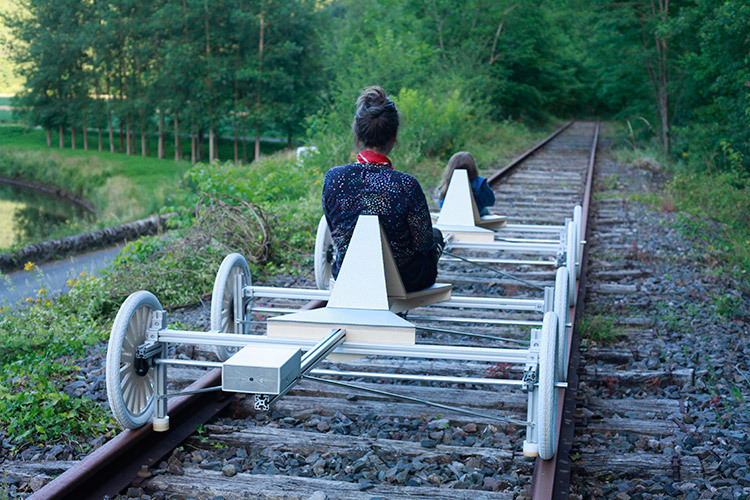 HeHe, who challenge the idea of railway vehicles being heavy objects from a 19th Century industrial era have also taken the DIY versus giant infrastructure approach in their (currently imagined) Artists Rail Network which promotes an alternative vision of rail travel. 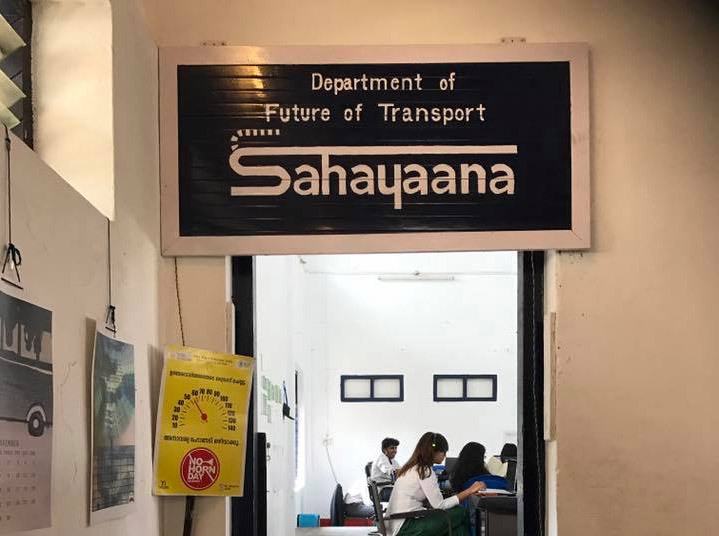 Another recent fictive approach was Bangalore artist Suresh Kumar’s creation of the Department of the Future of Transport, a transport department complete with headquarters, logo and ID Badges promotion a concept of Sayhanna or “weaving our journeys together”. The fictive department set up temporary outposts on bus and rail stations and collected, in a bureaucratic fashion, the stories of commuters’ everyday journeys, finally presented at the Cochin Biennale in 2017. 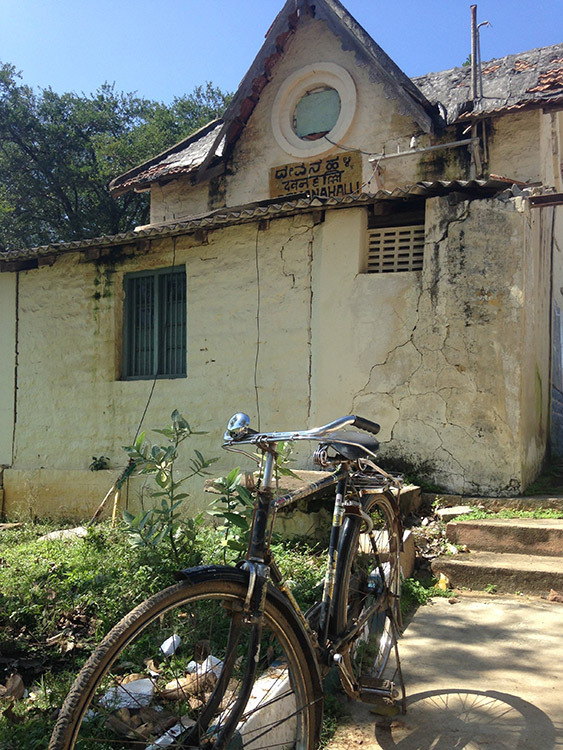 Kumar, before this project, made a key performance where he painstakingly dismantled and re-assembled his father’s bicycle, on which he travelled to work as an aeronautical engineer for 30 years of his life. Imagine future transportation bureaucracy with the Department of the Future of Transport. © Suresh Kumar G.
Rail vehicles as DIY activist strategies also feature in the work of SEFT-1 (Sonda de Exploración Ferroviaria Tripulada) (2006-2011), a road-rail vehicle created by Mexican artists Ivan Puig and Andres Padilla Domene. 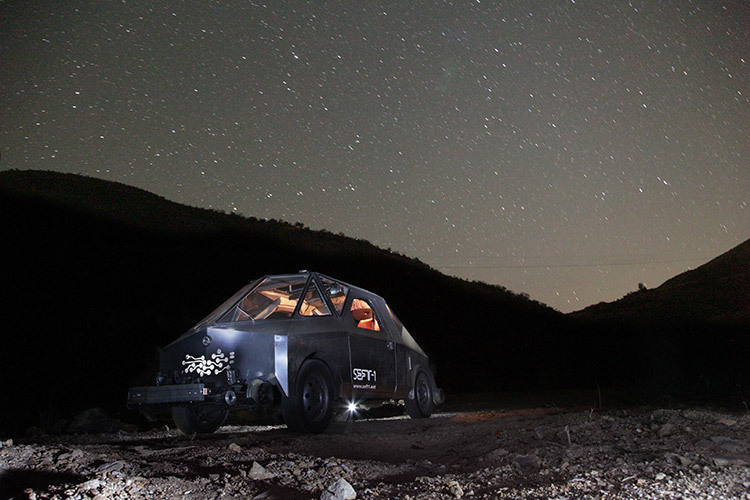 A Back to the Future-style, retro-futurist vehicle, created by backyard vehicle choppers in Mexico City, the SEFT-1 set out on a thousand mile journey to explore the abandoned railway lines of Mexico, to collect stories and discover the damage done by the overnight privatisation of the Mexican railway system, when all passenger services were abruptly halted in the name of profit. You would think that India, that has one of the largest rail passenger networks in the world, would be able to utilise suburban rail to ease traffic congestion. Bangalore, however hardly uses its suburban rail networks, despite one passing right by the airport. 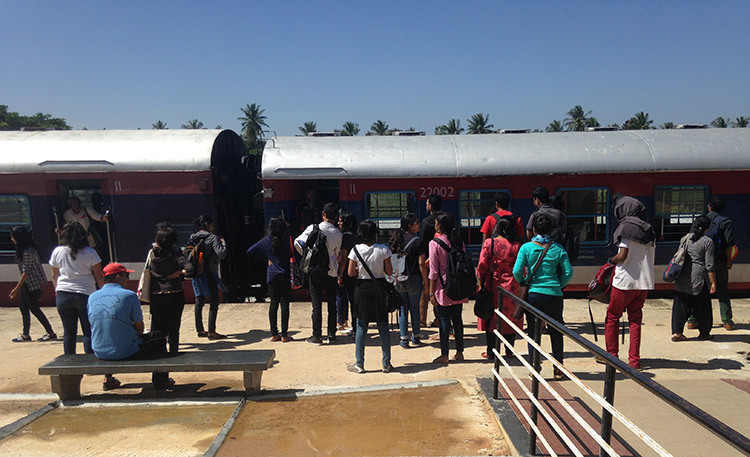 As an introduction to the Future of Transportation module at Srishti we conduct an entire class of 30-40 students on a suburban railway train (one that passes by only twice a day near the college), as a practical lesson on what could be possible. We ask the students to experience the train ride as if they were visitors to a near-earth planet. The Mexican artist Tania Candiani, last year took this concept to a further limit where she created with the students a Vimana—semi-mythical flying saucer technology for the Cochin Biennale, along with French artist Thomas Lasbouygues with his work with GPS-linked auto rickshaws. 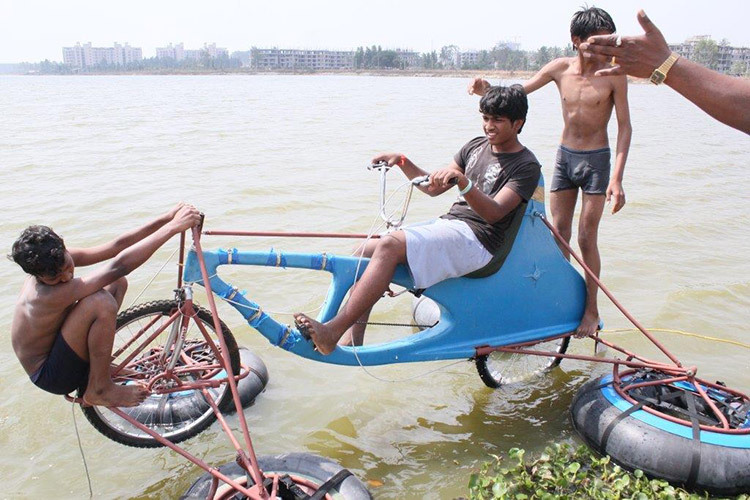 The most spectacular DIY experiment in small-scale activism, also with an auto rickshaw, was recently undertaked by Bangalore-based inventor Naveen Rabelli in Tejas project. 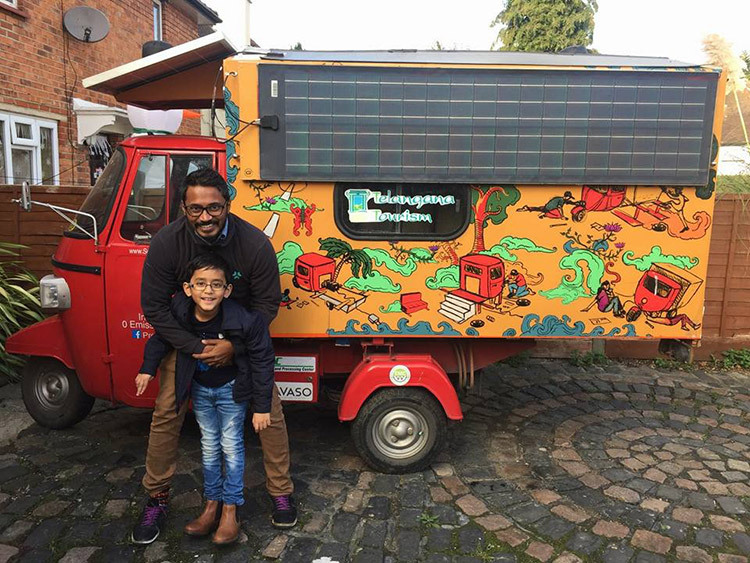 Stuck in traffic on the way to a kite festival, he had a sudden brainwave—why not build a solar powered tuk-tuk, and drive it across Asia to London? In the event the rickshaw had to charge overnight in some places, but this only increased the social dimension of the project as in each place he had to ask villagers for electricity to charge up. In exchange for his fantastical story he not only got power and a place to sleep in this vehicle, creating a chain of suppporters all the way through Iran, Turkey and Europe. In his own words: “They are all over India—they are loud and smoky and somehow have some Indianness in them. Everyone has been brought up in one” He started the process of converting one for his journey and in the two-year process so shared his dream in schools around India. He recalls one father saying his son had dreamed of owning a Lamborghini – now he just wants a solar tuk-tuk. The basic Piaggo Ape model auto-rickshaw was converted into a solar-powered zero-emission vehicle, with the same specifications as a petrol-driven one, in which Rabelli slept on his 10,000 kilometer journey to London. The Tejas Project (meaning Radiance in Sanskrit) is an example of a single inventor’s crazy persistence, thinking like an artist to subvert our expectations about impossible transport infrastructures and link together ordinary people with a viral thought-process that may, somehow lead to a step-change in thinking about sustainability.